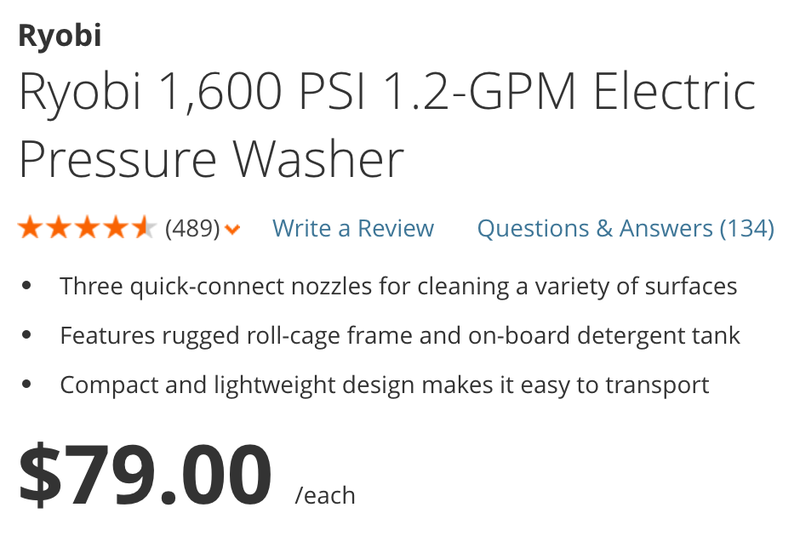 Home Depot offers the Ryobi 1600PSI 1.2GPM Electric Pressure Washer for $79 shipped. For comparison, it usually goes for around $120 and today’s deal is the best offer currently available. With warm weather just around the corner, it’s time to start cleaning up the mess left behind by winter. Features include 1600PSI of power, an electric engine, and multiple included tips for different jobs. Rated 4.5/5 stars by 489 Home Depot customers. The RYOBI 1600 PSI Pressure Washer is compact and lightweight, making it easy to move to various locations around the house and job site. With a powerful 13 Amp electric motor, this unit delivers 1600 PSI of force for quick cleaning of driveways, decks, windows, and patio furniture. Featuring a durable and compact roll-cage frame design, it is designed for easy transport. The on-board detergent tank offers hassle-free cleaning by eliminating the need to drag a bucket and hose behind you. The RYOBI 1600 PSI Pressure Washer is equipped with on-board accessory storage for added convenience and a bonus Turbo Nozzle for up to 50% more cleaning power. It is backed with the RYOBI 3-year limited warranty and is guaranteed to deliver results for years to come.